Duck is one of those things I cook that my whole family get excited about. We all love it, we all are excited about dinner when duck is served. This dish I usually do two ways, I make it with both duck marylands and duck breasts. My husband and 10 year old love duck marylands while my other two kids and I love duck breasts. So I will here provide cooking methods here for both types of duck pieces. But you can use 4 duck marylands or just 4 duck breasts if you don't want to do the extra work by doing a combination of the two. If you are going to use a combination of duck breast and duck maryland, time it so that both meats are resting at the same time. So start with the maryland and when you have 10 minutes left in cooking time, start the duck breast cooking. Now I also like to bake my duck marylands for 30 minutes, after frying them, as the meat is on the bone and I find it needs to cook longer and is easier to eat when like that. Meat from a 'pink' cooked maryland for me, is hard to eat, as the meat doesn't come off the bone easily. The maryland does not dry out like an overcooked breast does, it is a lot more forgiving. But if you prefer the maryland pink, the original recipe baked it for 8 minutes for medium, this is completely up to you. The salad is delicious, fresh, tasty, super nice. It says to use pink grapefruit which is seasonal and sweeter than the yellow variety. If you can't find pink grapefruit, I have also made it with ruby red grapefruit as it is also sweet, but I would avoid the yellow variety, it would be a bit too tart. So if you love duck, or would like to try duck, this is a good recipe to try. The duck is super tasty, kept very simple in it's flavour. 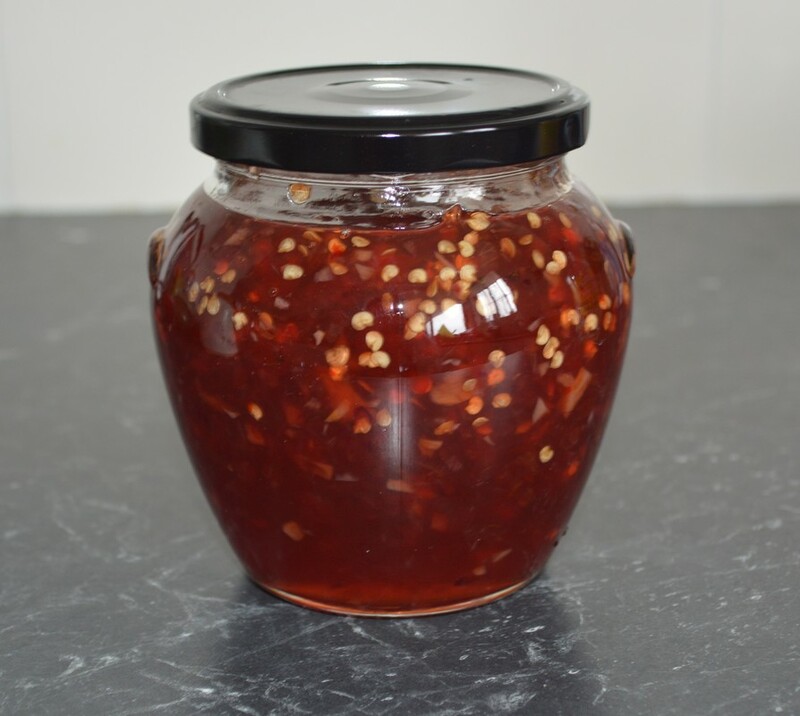 The salad is fresh and delicious and the chilli jam gives it a lovely spicy kick to complete the dish. 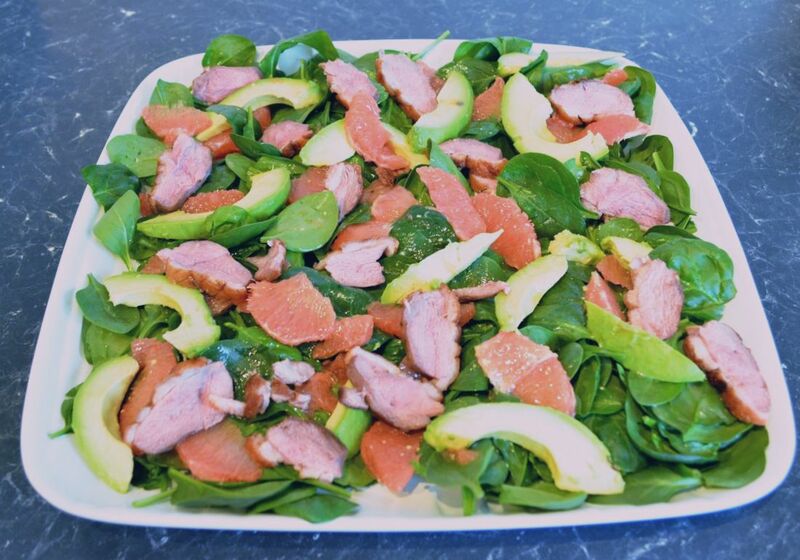 ​For the pink grapefruit and Avocado Salad: ​Use a small knife to remove the skin and white pith from the grapefruit. Holding the grapefruit over a large bowl to catch juices, segment the fruit. Place the grapefruit segments on a plate. Once the grapefruit has been segmented, squeeze the membrane over the bowl to release any remaining juices. Add the extra virgin olive oil, mustard and sugar. Season with salt and white pepper, whisk to combine. Set aside until needed. If using Duck Marylands: Use a sharp knife to score the duck skin. Rub lightly with olive oil and season with salt and pepper. Heat a large ovenproof frying pan over high heat. Cook the duck skin side down for 2-3 minutes until golden, turn and cook for 2 minutes. Transfer to the oven and roast for 30 minutes or until cooked to your liking. Cover and set aside to rest for 5-10 minutes. If using Duck Breast: Score the skin of the duck breasts in a diamond pattern, then season well with salt and pepper. Heat a large non stick frying pan over medium-high heat until hot. Add duck, skin side down, and cook for 6-7 minutes or until golden. Turn over and cook for 6 minutes for medium. Remove the pan from the heat. Cover and allow to rest in the warm pan for 5-10 minutes. Slice the duck before serving. 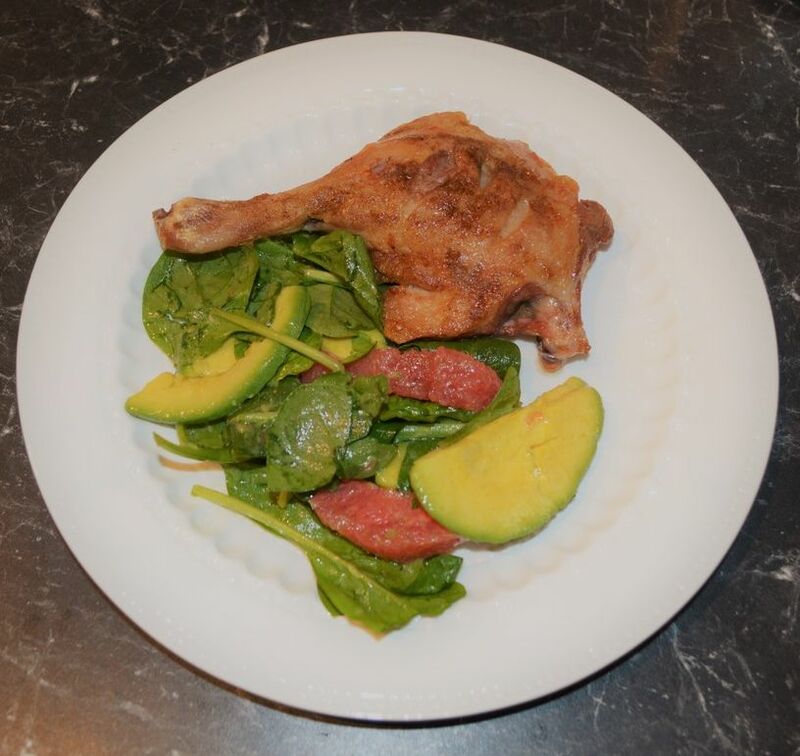 Just before serving add the grapefruit segments, spinach and avocado to the salad dressing, and toss gently to coat. 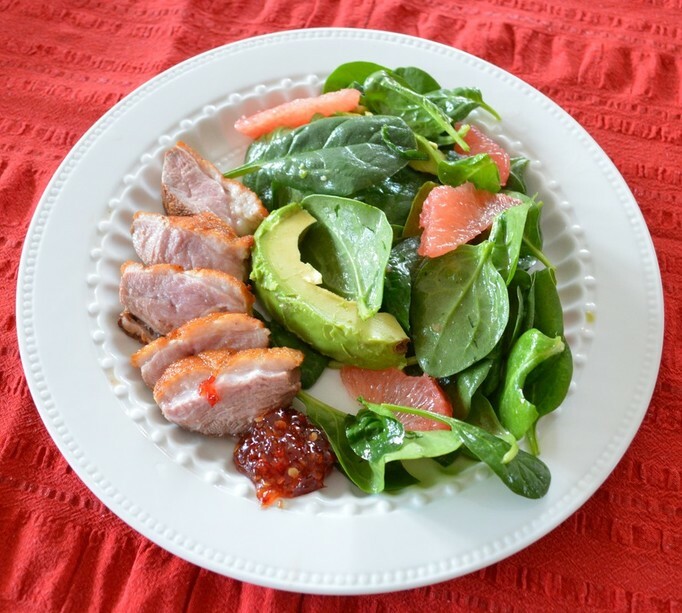 Pile the salad onto serving plates, top with duck and serve with a dollop of chilli jam.